Department of Computer Science and Engineering, School of Engineering & Technology is organizing Expert Talk by World’s Youngest IBM Watson Programmer “MASTER TANMAY BAKSHI” on 30th Nov 2018. Started coding at the age of 5. Created an iOS app at the age of 9. Has presented for UN, Apple, IBM, Walmart, Linux foundation, NASSCOM and many other Organisations. Hosted a TEDX Talk and Keynote speaker at IBM Watson summits around the world. Addressed more than 200,000 executives, leaders, developers and professional across the globe. Passionate about developing AI, Machine Learning algorithms specially in the fields of education and Healthcare. Master Tanmay Bakshi. He is a 15 years old Author, AI Expert, TED Keynote speaker, and a media personality who has already addressed over 200,000 executives, leaders, intellectuals, and developers worldwide at international conferences, schools and universities, financial institutions and multinationals. The United Nations, Linux Foundation, Apple, SAP, IBM, Walmart, Twilio, Internal Institute of Auditors, and HSBC are just some of the organizations he’s spoken at. His passion for building technology since he was 5 years old, brought him to the front page of The Vancouver Sun, and has been covered by The Toronto Star, Bloomberg Businessweek, New York Times, The Wall Street Journal, ABC Australia, CNN, CTV, CBC, The AM Show (New Zealand), and The Economic Times. His love for coding led him to create AskTanmay, which is the world’s first Natural Language Question Answering System to be powered by IBM Watson APIs. Tanmay’s goal to help at least 100,000 aspiring coders in learning how to code through his workshops, seminars and his YouTube channel called Tanmay Teaches has earned him numerous recognitions. These include the Twilio Doer Award, Knowledge Ambassador Award, Global Goodwill Ambassador at LinkedIn, and IBM Champion for Cloud and Honorary Cloud Advisor. His love to implement AI architectures led him to build numerous applications in fields ranging from finance to cybersecurity, education to music and entertainment. His inclination towards implementing AI in the field of healthcare got him working on two of his main projects, which are very close to his heart – the first is focused on helping those with Rett Syndrome so they can “speak” through the detection and interpretation of EEG bio-signals. These EEG signals are analyzed by cognitive systems. The second project focuses on suicide prevention through depression mitigation using Augmented Intelligence. Tanmay loves to play table tennis, cricket, and enjoys biking when the Canadian weather allows for it. He also contributes his time as a Computational Thinking Coach at The 4th Industrial Revolution Organization, an advisor and lead faculty at Grad Valley Data Science, and the host of his talk series, AI Café, and IBM’s Watson Made Simple with Tanmay. Departments of Microbiology, School of Medical Sciences & Research and Sharda Hospital, Sharda University is celebrating “World AIDS Day” on 30th Nov. 2018 by organizing the following activities. Venue: College Auditorium 5th Floor SMSR Building. All the MBBS students of 3rd & 5th Semester to attend the skit presentation. School of Nursing Sciences & Research (SNS&R) Dept of Community Health Nursing and Child Health Nursing department is organizing an ‘World AIDS Day’ celebration on December 1st in Ganghola village RHTC, Panchayatan by M.Sc 1st & 2nd year, BSc (N) IV Year students, PBBSC 2nd year students. The 30th anniversary of World AIDS Day will be marked on 1 December 2018. Since 1988, the AIDS response has made significant progress and today millions of people living with HIV are leading healthy and productive lives. But we still have miles to go, as the latest UNAIDS report shows, and one of the challenges remaining is knowledge of HIV status. UNAIDS estimates that more than 9.4 million people living with HIV still do not know their status. To create awareness regarding AIDS and its prevention. 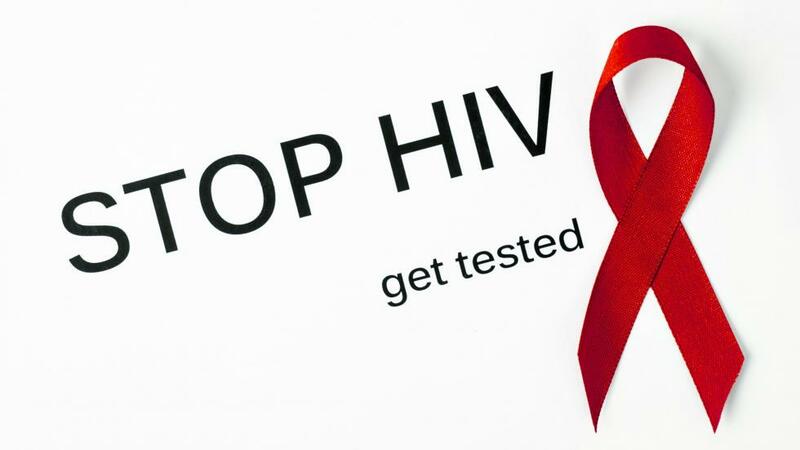 To bring about positive attitude among people of the Community towards HIV affected people. To remove stigmas of the people regarding AIDS and its transmission. To encourage more students from the schools, universities and social structures to contribute awareness among the various people about AIDS and its prevention. 09:00am -09:15am Rally starts from University Campus. 11a.m -11.30a.m Display of posters regarding information about the AIDS. Mr. Sreeraja Kumar. – Assoc. Prof.
Group Activity On World Aids Day 2018 “Know Your Status’ Medical-Surgical And Fundamental Department of SNSR, Sharda University is Celebrating “World Aids Day” on 1st December 2018 At Sharda Hospital. Human immunodeficiency virus infection and acquired immune deficiency syndrome (HIV/AIDS) is a spectrum of condition caused by infection with the human immunodeficiency virus (HIV) significant progress has been made in the AIDS response since 1988, and today three in four people living with HIV who do not know their status but we still have miles to go and that includes reaching people living with HIV who do not know their status and ensuring that they are linked to quality care and prevention services. World AIDS Day takes place on the 1st December each year. It’s an opportunity for people worldwide to unite the fight against HIV, to show support for the people living with HIV, And to commemorate those who have died from an AIDS-related illness. Founded in 1988, world AIDS day was the first ever global health day. The international symbols of HIV awareness and support are red ribbon. Event:- Roleplay and chart making. To raise awareness among outpatients of Sharda hospital regarding AIDS disease and its prevention. To reduce the risk of AIDS in the population. To enhance the knowledge regarding AIDS and it’s risk factors. To enhance the skills of students through role play. To enhance the knowledge of students regarding AIDS and its prevention. School of Basic Sciences & Research (SBSR), Sharda University is organizing ‘Parent Teacher Meeting (PTM)’ on 1st December 2018 @ Sharda University, Block I, Classrooms 111. The School of Basic Sciences & Research (SBSR), Sharda University is organizing ‘Parent Teacher Meeting (PTM)’ on 1st December 2018 (Saturday). Discuss the attendance of their ward. Overall performance of the student. 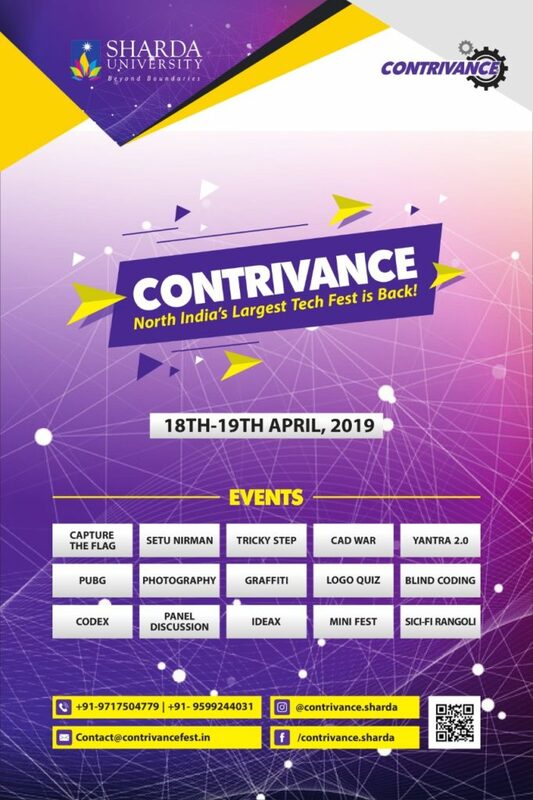 Venue: Sharda University, Block I, Classrooms 111. School of Humanities and Social Sciences (old name SOLC) is organizing their Journal club meeting on 1st December, 2018 on Saturday @ Room No: 804, 8th Floor, Block 7, Sharda University. School of Humanities and Social Sciences (old name SOLC) is organizing their Journal club meeting on 1st December 2018 on Saturday. To provide a platform for faculties/ research scholars to share their knowledge and skills in teaching and pedagogy, creative writing and research on varied ideas related to Literature and Culture, Individual and Society, Mythology, Gender, Psychology, International Politics and other areas of diversity. Dr. Mukuta Borah, Assistant Professor of English, SHSS. Date: 1st of December, 2018. Venue: Room No: 804, 8th Floor, Block 7, Sharda University. Department of Chemistry and Biochemistry is organizing Journal Club Meeting on December 1, 2018. The Department of Anatomy, School of Medical Sciences & Research Sharda University is organizing a Chart/Model Making Competition @ Department of Anatomy (Ground Floor) SMS&R. The Department of Anatomy, School of Medical Sciences & Research Sharda University is organizing a Chart/Model Making Competition for 1st Year MBBS Students (Batch 2018-19) on various topics from Gross Anatomy and Embryology. • To inculcate interest for the subject amongst students. • To improve the understanding of the subject. • To bring out their creative side. • To encourage team work. Venue: Department of Anatomy (Ground Floor) SMS&R. All are cordially invited to grace the occasion and to encourage the students. School of Humanities and Social Sciences is organizing a visit to Agra for the International students of the Department of Skill Development in Foreign Languages on 11 December 2018. Every place has a message and every tour has an element of entertainment, education and of course fun. However, there are certain locations that stand apart for the sheer excellence they have to offer in terms of natural beauty or manmade wonders. Agra in Uttar Pradesh is one such place. An immense mausoleum of white marble, built in Agra between 1631 and 1648 by order of the Mughal emperor Shah Jahan in memory of his favorite wife, the Taj Mahal is the jewel of Muslim art in India and one of the universally admired masterpieces of the world’s heritage. Famous as one of the Seven Wonders of the World, the Taj Mahal at Agra, India, is the epitome of true love and passion. Taj Mahal represents the finest architectural and artistic achievement through perfect harmony and excellent craftsmanship in a whole range of Indo-Islamic sepulchral architecture. It is a masterpiece of architectural style in conception, treatment, and execution and has unique aesthetic qualities in balance, symmetry and harmonious blending of various elements. The architectural beauty and magnificence of the Taj Mahal has never been surpassed. It is said to be the most beautiful monument built by the Mughal rulers and represents the zenith of the Mughal architecture. Taj Mahal, synonymous with India’s identity, is the crowning jewel of Mughal architecture in India. An architectural marvel, the structure incorporates elements of Persian influences like the design of the Dome and incorporation of arched entrances or ‘Iwans’ along with inspiration from contemporary Hindu design elements like chhatris and copious incorporation of the lotus motif. Described by Tagore as “the tear-drop on the cheek of time”, the monument embodies funereal austerity turned into the most beautiful reminder of eternal love. The visit to Agra is arranged for the international students of the Department of Foreign Languages, School of Humanities and Social Sciences. The students will surely enjoy this visit to the world famous Taj Mahal. Visiting Agra fort will be an added attraction and will acquaint them better with the rich heritage of India. 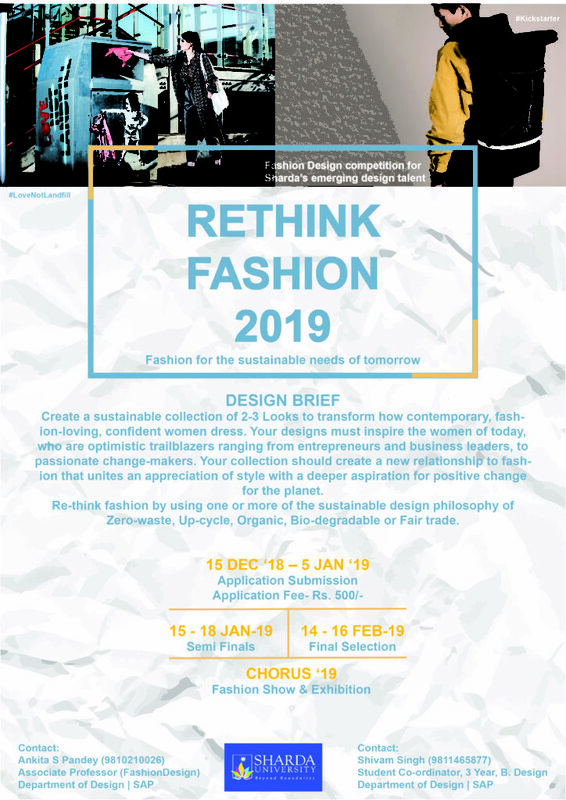 School of Creative Art, Design and Media Studies, Department of Design is organizing “RETHINK FASHION 2019” Competition Vision- The competition provides education, inspiration & opportunity to emerging fashion designers of Sharda University about sustainable design theories and techniques in order to drive growth towards a circular fashion system. If you have what it takes to Rethink Fashion? The Jury is looking for emerging design talent for transformative ideas of Fashion for the sustainable needs of tomorrow. 1. To prepare students for National & International Design competitions. 2. To give an opportunity to the students to work on emerging needs of the future. 3. To collectively begin work on the creation of Sharda Fashion Think Tank on Sustainable Fashion. The Department of Physiotherapy, SAHS is organizing 1 DAY HANDS-ON WORKSHOP “CANCER REHABILITATION (EMPHASIS ON LYMPHEDEMA MANAGEMENT)”on 21st December 2018. Introduction to Cancer & its Management. Post Surgical Care & Education. Introduction to the lymphatic system & its management. Principles and Prescription of Compression Garments. Home Maintenance programme and self. Promoting general, oral and cleanliness awareness among schoolchildren and villagers of Talra. Acclimatizing students towards social welfare and community participation by engaging them in an awareness rally in the village. Encouraging Public Speaking through an extempore competition. Promoting bonding and joyfulness in the festive season through Christmas tree decoration, dance competition and a wall hanging (made out of common household waste) competition. Inculcating responsibility and motivation among school students by signing a pledge on maintenance of Oral and General Health.